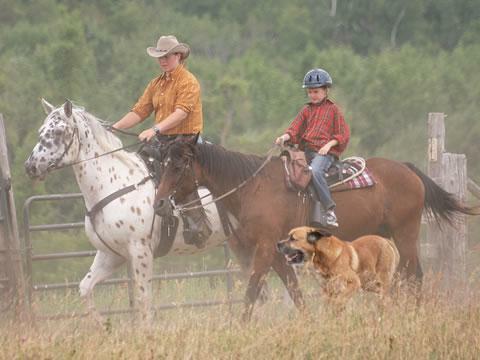 Ranch riding camps suitable for 10 - 15yr olds. Plan to join other Wranglers for a 5 day horse lovers dream camp! Our program is tailored to interweave daily activities into the rural lifestyle of the ranch. The program is suitable for those who want to learn more about horses and ranching and our horsemanship philosophy. Camp Fees are $400 per person which includes horsemanship, meals, snacks, sleepover and HST. Horse enthusiasts need only apply! Tell us all about yourself why you want to come to our camp: Send us your Ranch Wishes profile so that we can best place you. Overnight Campout, sleep under the stars with your horse! Camp Fees are $650 per person which includes horsemanship and riding time, meals, snacks, sleepover and HST. Horse enthusiasts need only apply! Send us your riding experience profile so that we can best place you. Arrive daily before 8:30am with pick-up at 5:00pm. Space is limited so best start thinking about what camp you want to join! Age is limited to 10 - 15 year olds. Horse enthusiasts need only apply! Tell us all about why you want to come to our camp: Send us your riding experience profile so that we can best place you. A 50% deposit is due 7 days after your placement has been confirmed with the balance due on arrival. A full sleepover option is available - but we need to talk!. Come to Learn, Laugh, Work Hard and Play Hard! If you would like to receive more information regarding this or future programs, contact us by email or phone at 519-925-0152.